Pizza crust is not a hopeless cause for those who are gluten free, but it can be a bit frustrating. In some ways, though, I prefer it. I was never very good at stretching out a pizza dough and spreading it onto a pizza pan, but with this recipe, you don’t do any stretching; the dough is spread over the pizza pan with a spatula, because the texture and consistency is more like batter than dough. 1. Combine the water and yeast and allow the yeast to dissolve. Add all the other liquid ingredients and mix thoroughly (I use an electric hand mixer). 2. Combine all the dry ingredients and then blend into the liquid ingredients with the mixer. Continue mixing until the batter is smooth. 3. Spray a 15×14 cookie sheet (that’s a little over 200 square inches, in case you need to find alternatives to a 15×14). Dump the batter onto the middle of the sheet and use a sprayed spatula to spread it evenly around. Spread it right to the very edges of the sheet. 4. Place the crust into the oven and cook for 30 minutes, without toppings. While the dough is cooking, prepare veggies, meat, sauce and cheese you will be using to top your pizza. After 30 minutes, take the crust out, raise the oven temperature to 425, and add toppings to the crust. Your sauce and toppings can go pretty much to the edge of the pizza; be aware that the edges will probably be quite crispy, so it’ll be nice to have some toppings there! 5. Put the pizza back in the oven and cook for 10 to 15 minutes, depending on how brown you like your cheese to be! And that’s it! 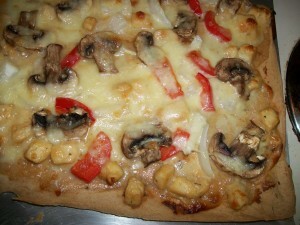 The pizza in the picture is a chicken pizza with white sauce, mushrooms, onions, and red peppers. So, yeah, this isn’t my gluten-free recipe. It sure is yummy! Dash of nutmeg and cloves if desired. 1 stick of butter or margarine. 1. Stir together all the filling ingredients and place in an 8×8 or 9×9 inch pan. 2. Cut butter into the other topping ingredients until mixture is crumbly. 3. Sprinkle topping over apples and pat down gently. Bake in a 375 degree oven for 50 to 60 minutes. Nothing says autumn like apples and apple cider, right? 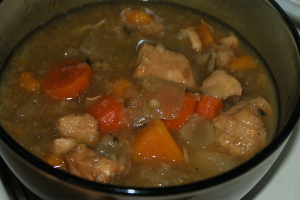 This stew contains chicken, apples, cider, sweet potatoes and more. And as an added bonus, it’s gluten free, so you can serve it to celiacs and those with wheat allergies. And as an extra added bonus, it’s a slow cooker recipe, so you get to smell it cooking all day long. 1. Add oil to a frying pan and heat to medium-high. Cut the chicken in bite-sized pieces. Mix the potato starch, brown rice flour, and garlic salt, and either sprinkle it over the chicken or put it in a bag and shake together with the chicken to thoroughly coat the pieces. 2. Place chicken in fry pan and cook, turning occasionally. 4. Add all the ingredients to the slow cooker and stir them together. Set the slow cooker to LOW and cook all day (I aim for 8 hours). We like our stew thick, so if at the end of the cooking I think it’s too thin, I make a slurry of potato starch or corn starch and mix it in. Turn off the slow cooker and let the stew cool for a half-hour to an hour before serving. Variation: Laura prefers this stew with sweet potatoes, but I like it better with regular potatoes. Try it both ways, and let us know who you agree with! But this pie is gluten free and simple. In fact, the crust is poured. Can’t get simpler than that, right? This pie has a custardy flavor, so if you’re not a fan of custard, walk away now. I have a 9.5″ pie plate that I make this in, and it fills it right up; if you’re using a 9″, it probably will not be big enough, so you might want to back off the amount of peaches or raspberries you use, by a cup or so. 1. Slice your peaches thinly, and combine in a mixing bowl with the raspberries. Add the cinnamon, and mix to thoroughly coat the fruit. 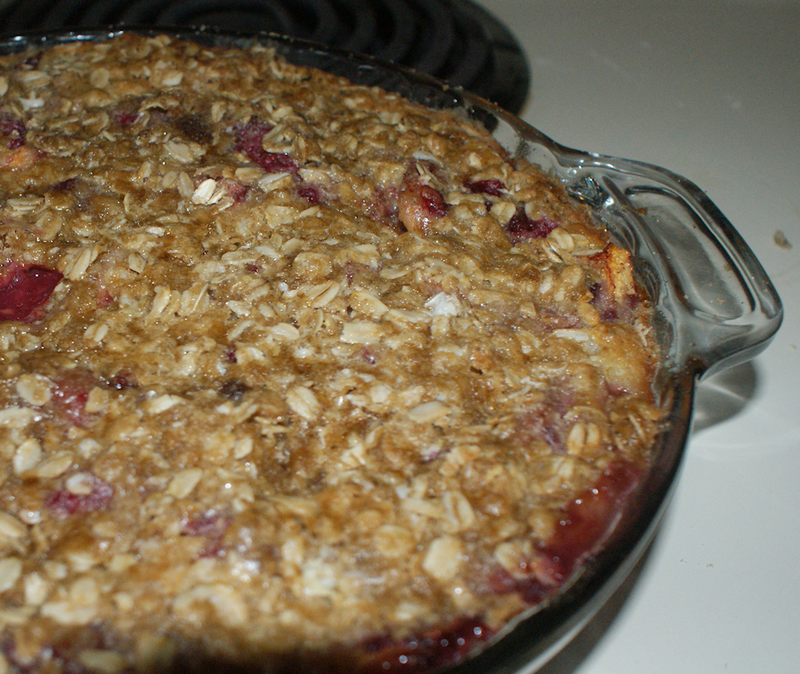 Pour the fruit into the bottom of a sprayed or greased 9.5″ pie plate. Spread the fruit evenly. 2. Mix the crust’s dry ingredients, and then add the milk, eggs and melted butter. Stir until smooth. Pour this mixture evenly over the top of the fruit. It will drip down through and form the crust, as well as fill in the cracks between the fruit. 3. 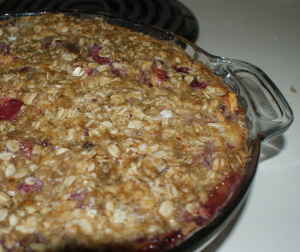 For the topping, stir together the sugar, starch and oats. Add in the chilled butter in chunks and cut it in with knives or a pastry cutter. Sprinkle the resulting mixture over the pie. 4. Put the pie in the oven and cook for 45 minutes. Let it cool before serving. Cover in cling wrap and refrigerate. If you cut back on either fruit to make it fit in a 9″ plate, most people would thank you to cut back on the raspberries. Myself, I prefer a nice tart pie, so I am heavy-handed with the raspberries. Vanilla ice cream? You betcha! Goes great with this pie. Want to try different fruit? Substitute apples, or apples and blueberries. Strawberries and rhubarb. Someday I’m going to try strawberry-mango! Invent your own variations, and drop me a note to let me know what you tried. Have you seen this little novelty? 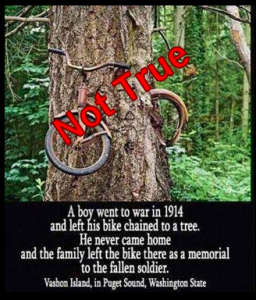 It’s a real picture of a real place, where a bicycle is embedded in a tree. That part is true. What’s NOT true is the caption underneath it. But, people don’t seem to care that it’s not true, because it has a bittersweet, tragic ring to it (and could arguably be used as anti-war propaganda). 1. Those who recognize that the caption can’t be accurate, either because that particular bicycle was manufactured long after 1914, or because the placement of the bike high above the ground doesn’t match the description of how it happened, or because the boy small enough to ride that little bike was way too young to be going off to war. It’s not a fable. It’s a lie. There’s a difference. Let’s talk for a second about fables. You know Aesop, right? The fable of the fox and the grapes? The ant and the grasshopper? The town mouse and the country mouse? You know what they all have in common? It’s obvious that they’re made up stories, and are not intended to fool anyone into thinking they actually happened. In case you didn’t notice, the characters are all animals! What? You mean there really wasn’t a tortoise who challenged a hare to a race? Why does this distinction matter? Because in our “postmodern” mentality, stories are becoming more important than reality. Because honesty is becoming less and less important in society at large. Because people are more concerned with their own viewpoint than with truth. Or even worse, we’re more concerned about our online presence and popularity than with the truth. Recently I read an article in which a journalist was quoted as saying that the news media are so eager to get a story online first that it’s becoming the standard mode of operation to post a story, then do the fact checking, and then do retractions and revisions on incorrect information. Apparently, having a story is more important than having a true story. It reminds me of a friend of mine who, back during the “Occupy” movement, shared a photo of a woman with a gaping wound in her cheek, and a caption that claimed police brutality against the protesters. Well, it only took about 15 seconds of researching to determine that the photo and the caption were 100% unrelated. In other words, it was a lie. A lie that had been shared over a quarter of a million times on Facebook. I hate to break it to you, but I don’t care what your viewpoint is (even if your viewpoint matches mine!) – your viewpoint is not more important than the truth, and if you have to lie to support your viewpoint, then I’m not even interested in hearing what you have to say. If you have something you’d like to say, find a true story that backs up your viewpoint. Or tell a fable that’s clearly a fable. Don’t mix and match, because there’s already too much confusion in this world of ours, and people already don’t know who they can trust. Jesus said, “Let your yes be yes and your no be no.” And He – the master storyteller – never left his listeners in doubt about whether His story was a “once upon a time” or not. 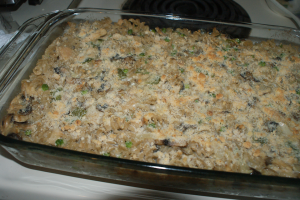 Tuna noodle casserole was one of those meals I remember enjoying in my childhood, but now it has to be gluten free. 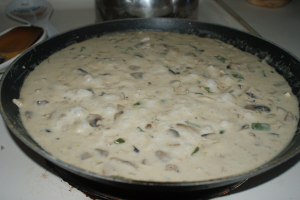 I start with my Gluten-Free Cream of Mushroom Soup as the sauce base, and build from there. 2. Cook the gluten-free pasta according to package directions. I wait until the pasta is just a couple minutes from done according to its “official” cook time and then toss in the frozen peas. Let the liquid return to a boil and cook a little longer. If you don’t want to do that, you can prepare the peas separately according to package instructions. 3. Drain the pasta and peas, mix with the mushroom sauce, and spread the entire mixture evenly in a sprayed 9×13 baking dish. 4. At this point, if I have a couple spare slices of gluten-free bread, I’ll grind them up in a food processor and mix them with some Parmesan cheese (and maybe a little salt & pepper), and then spread them evenly across the top of the casserole. If I don’t have bread crumbs, I sprinkle grated Parmesan cheese over the top. Put the casserole in the oven and cook for 30 minutes. * Use either white or light tuna; white tuna will result in a casserole which has a less “fishy” taste. This is my own recipe for gluten-free cream of mushroom soup. It’s a lightly spiced soup, because I want to keep it generic enough to use in different sorts of recipes, like a tuna casserole or a swedish-meatball-style goulash. So think of this as a base that you can use for other recipes. Your cream of mushroom soup will look creamier and less chunky than mine; this picture was taken after I’d added in extra ingredients for the casserole I was making. 1. Slice the mushrooms. If you prefer your cream of mushroom soup like what you can buy in a can, chop your mushrooms small. We like bigger chunks. Saute the mushrooms in oil or butter, just for a minute or two. Then toss in the 2 cloves of minced garlic. The moment that garlic flavor hits your nose, you’re done. Take the veggies off the heat and save them for later. 2. In a saucepan or a frying pan (I use a frying pan), melt 3 tablespoons of butter over medium-low heat. Once it’s melted, add 3 tablespoons of brown rice flour, and immediately start stirring the entire mixture until it’s smooth. It’ll feel a bit granular, but the mixture should turn a nice shade of reddish-brown, and start bubbling. Then it’s time to add the milk. Stir it in, and keep stirring until the mixture starts to thicken. Then go ahead and add in the heavy cream and chicken broth. 3. When the sauce starts to bubble, turn the heat down a bit, and add the sauteed veggies, salt and pepper. Let the soup simmer for 15 or 20 minutes, and then it’s ready to either eat, or add into whatever recipe you’re making! Today I made baby popcorn. Yep, that’s right! If you don’t believe me, take a look at the picture. Take a close look, and do a size comparison of my fingers and the popcorn kernels. 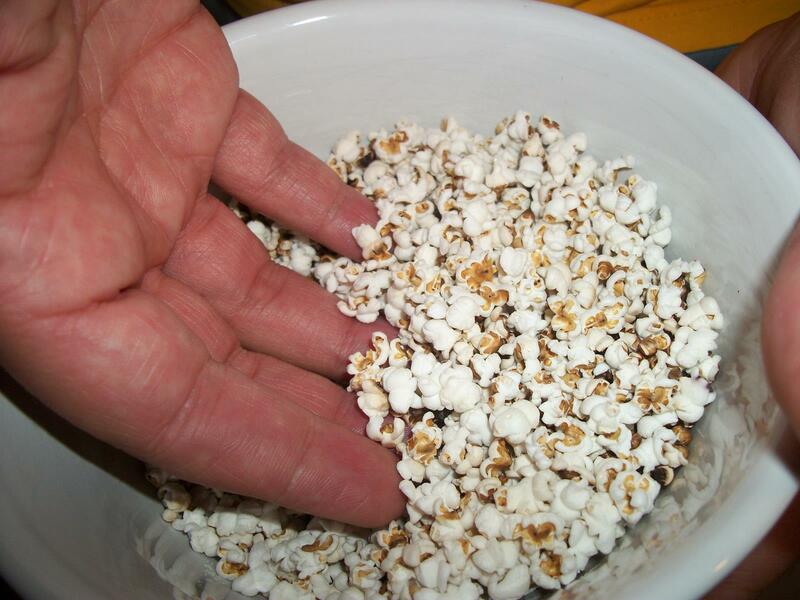 Either I have monstrously large fingers, or those popcorn kernels are really small. So what’s the deal? Well, the deal is that Ocean State Job Lots is running a 20% off sale on all Bob’s Red Mill products. And since I’m doing gluten free, I get excited about those sales! So I was browsing the enormous BRM display, getting multiple bags of sorghum flour, potato starch, and ground flaxseed, and my eye was caught by a bag that said, “Whole Grain Sorghum.” It wasn’t ground sorghum; it was entire kernels of the grain. On the back, there was a recipe for “popped sorghum.” 1/4 cup of sorghum in a paper bag in the microwave, or in a saucepan on the stove top. I tried it on the stove top, because we couldn’t find any paper bags to use in the microwave. What does it taste like? Well, like popcorn, more or less! Add a little salt and munch away! I developed this recipe because I don’t like (and don’t want to waste money on) the GF bread you can buy at stores, and also because I hated the fact that most recipes for GF bread are for small 8×4 pans instead of the regular 9×5 pans. People do 8×4 because it’s less likely to fall, but if you do it right, you can do a 9×5 that doesn’t fall. A squirt (yeah, I don’t measure this, but it’s not a lot!) of molasses. Remember that it’s the sugars that cause browning, and since this loaf sits in the oven for a VERY long time, too much sugar results in a scorched loaf. Preheat the oven to 375 degrees. Divide the dough evenly between two sprayed 9×5 bread pans. Use a spatula (sprayed with cooking spray) to smooth the tops of the loaves, and let rise for 25 minutes. Place loaves in the oven. Avoid putting the loaves too close to the top of the oven, as the bread cooks a long time, and this will cause the crust to overcook. After 40 minutes, gently place a piece of tin foil over the top of each loaf, so the crust won’t burn, and raise the temperature to 425. Allow the bread to cook for 30 more minutes. The goal is to have the internal temp at 208 degrees, so adjust cooking times accordingly. If you insert a thermometer, be aware that the loaf will probably fall in that spot! A trick to help avoid fallen loaves: The loaves are very delicate at this point, and unnecessary jarring will cause them to fall. I usually shut the oven off and carefully remove the foil, and then leave the loaves to cool down gradually in the oven before I handle them. 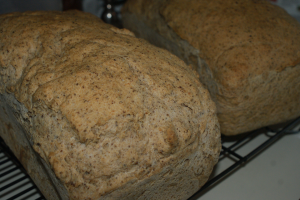 Once they’ve cooled for 15 or 20 minutes, I take them out, and very gently tip the pan sideways and pull the loaf out with my other hand and set it on a wire rack to finish cooling. Once they’re cooled I refrigerate the loaves for a couple hours before slicing. Store the loaves in airtight containers. Once the bread is more than a couple days old, I always toast the slices before using.